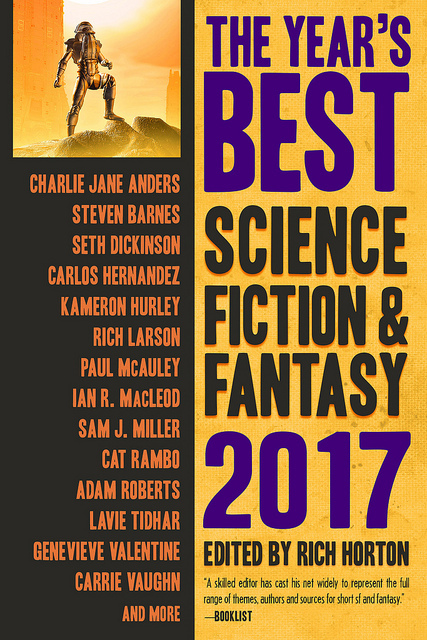 The Year’s Best Science Fiction & Fantasy 2017, edited by Rich Horton, is now available and includes my novelette "Blood Grains Speak Through Memories." The novelette originally appeared in Beneath Ceaseless Skies and was a finalist for the Nebula Award. And in a total "wow!" moment, Horton says in the book's introduction that I am "one of the most original and adventurous writers of strange sf for the past decade." Let me repeat: WOW! Many thanks to Horton for the kind words and for selecting my story. The anthology is available from Amazon, Barnes & Noble, and other bookstores. Below is the anthology's table of contents.